What better way to discuss a book about ethics than to begin with a disclosure. 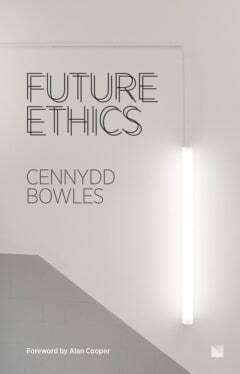 Not only have I known Cennydd for many years, but he was kind enough to let me review early drafts of his latest book, Future Ethics . While there’s little hope I can convince you that I’m an impartial reviewer, it’s worth marking the completion of this two-year endeavour all the same; even more so when the resulting work is both so valuable and necessary. As a way of thanking me for my feedback, Cennydd offered me a copy of the book. But this offer came with a choice: would I like to be emailed a digital copy, or get the paperback, printed and fulfilled by Amazon, a company for which I have opinions. Before I could even turn to the first page, here was a moral quandary. Should you buy this book — and you really should — this is a decision you will need to make also. Future Ethics introduces the reader to three schools of modern ethics, and uses each to interpret the ethical dilemmas we face today and those we are likely to encounter in the future. So let’s use these to make a judgement about the choice presented above; digital or paperback? A utilitarian would view this decision in terms of its consequences; which choice will increase the overall happiness of the world? I doubt it makes much difference to Cennydd whether a reader purchases a digital copy or the paperback fulfilled by Amazon as long as they buy the book, but from my point of view I know that I’m more likely to read it should I have it in my hands — a welcome opportunity to spend time away from a screen. There are ecological impacts relating to each choice of course, although likely negligible in the grand scheme of things. However, as a fervent boycotter of Amazon, to have them involved in this transaction is a test of my principles. As the book was a gift, I could reasonably opt for the paperback. If I was paying, my decision may have been different. A deontologist might reach a different conclusion. What if everyone decided to have Amazon fulfil and ship their order? Arguably this forms the basis of my boycott as we already know the answer: monopolistic business practices, displacement of local communities, avoidance of tax and poor treatment of warehouse workers. In this case, the decision should be to opt for the digital copy. A virtue ethicist would approach this from another perspective: would I be happy if everyone knew the decision I made? That I’m willing to say that I opted for the Amazon-tainted paperback would suggest I made the right decision, even if it meant the world’s happiness index was briefly dented. To see this simple choice as a moral dilemma demonstrates how principled I try to be, often to my own detriment. While it’s helpful to have these different means of ethical reasoning to tackle such dilemmas, they often raise more questions than they answer. When it comes to ethics, there are no shortcuts. Platitudes such as “if you’re not paying for the product, you are the product” dissuade us from understanding the complexities and consequences of different business models. Throwing around terms like surveillance capitalism can distort our understanding of what surveillance actually entails (hint: not a sign-up form). While the trolley problem is a fun theoretical debate, in reality the decision should almost always be to slam on the brakes. Throughout the book Cennydd shares some of the tools we can use in our day-to-day practice to widen our view of the world and recognise the impact our work can have on it. Be that choosing to adopt a veil of ignorance when making decisions, including futuring exercises in workshops, building “provocatypes” to stimulate debate, creating “personas non-grata” or appointing designated dissenters to widen our pool of perceived stakeholders, these tools can help us avoid the unintended consequences of our work, or at least be prepared for them. Given the books balanced examination of the current state of technology and where it may be headed, readers may find themselves feeling disponent. Cennydd is at pains for us not to retreat into fear and hopelessness but instead reach for a more optimistic outlook — but only if the reader is compelled to take action. In the last few weeks, I’ve heard from friends and former colleagues who’ve decided to join technology startups in sectors like banking and healthcare. While the former has a reputation for impropriety and misconduct in desperate need of remedy, the later has a proud tradition of ethical practice and professional standards that designers would be well advised to respect. New entrants into these markets tend to present their products as unquestionable forces for good, but their employees shouldn’t be so naive. If design is the application of ethics, then anyone designing digital products will see their role in a new light after reading this book. But should you wish to embark on a voyage of unknowable disruption, please read Cennydd’s book before stepping aboard ship, as the job of a designer is no longer plain sailing.